Aw, man. Today I’m mourning the passage of one of the all-time greats, Norm Breyfogle. This here is the first Batman comic I bought when I got into comix: Detective Comics 607, dated October 1989. It’s the fourth issue of an arc, so I came in at the tail end, but I was still hooked. 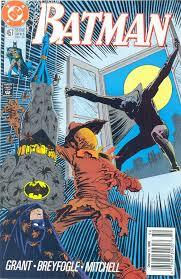 My comix habit started with three series: Batman (Aparo), Detective Comics, and the Shadow Strikes! (Eduardo Barretto – also RIP). Barretto struck me as the best artist – Aparo seemed a little square, and I wouldn’t really appreciate him until later. But ‘Tec, with Alan Grant writing and BREYFOGLE on art, was this little pocket of weirdness in the Batverse. BREYFOGLE’S Batman didn’t have the confident athleticism of Garcia-Lopez, who I always associate with Batman consumer products, and he wasn’t as abstract Image-inspired artists like Jim Lee. He knew his anatomy, but he wasn’t a draftsman quite like Aparo. BREYFOGLE’S art was fluid. BREYFOGLE’S Batman twisted around gargoyles or stood as imposing as a monolith. Sometimes he was abstract – just the outline of his white eyes, bat-ears and bat-eyebrows, and a scowl. 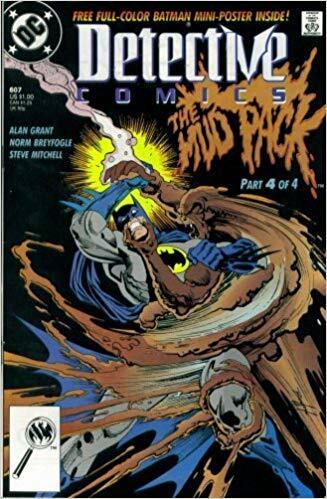 Other times, BREYFOGLE’S Batman was all too solid, folding over a kick or knocked halfway across the page by some lucky punk with a lead pipe. His Batman was truly grief-stricken whenever an innocent was hurt. BREYFOGLE’S Batman suffered. 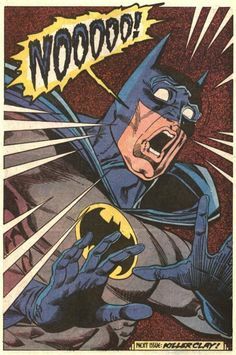 And no one, ever, did a better look of shock than BREYFOGLE. Uploading your consciousness to the cloud – we’re going to see if we can make that old sci-fi trope even more horrifying than it was already. While we’re talking about tropes, it’s a trope to say that “It came to me in a dream.” But … I still have a sense-memory of waking up with this scenario on my mind. This story is an example of what I call “dirtbag future.” Most of what we see as the future is just bolted onto the present. There’s not going to be a movement that wipes away the present and replaces it with a Jetsons-type future. That goes double for the people that are living here. I wanted to write a sci-fi story starring people I went to high school with. Micah did a great job with this one – my favorite moment is when he’s recording the message for his kids. I liked that on the page, but he really brought it to life. My favorite moment here is the very end, when Micah’s character says he thought there’d be more to the afterlife than this. It’s after the end for him, and he makes a bid for a little human connection. The machine just gives him a canned response that’s had all the humanity vetted out by the legal department. For me, the horror aspect of this story isn’t being trapped in a computer. It’s the idea that this amazing sci-fi technology would be used for filling out hospital paperwork. OK, OK, they’re not going to call me to write Star Wars 9. But if they do … I could not stop myself from doing an extended treatment for the next movie. I’m tying up plot points from the trilogy while leaning heavily into the F&*K Yeah! moments. Read my treatment to see Rey develop the power of God, the funeral of Leia, Poe’s massive gun, The Knights of Ren bullying Gen. Hux, Finn among the troops and #WookieHugs. I’ll be tweeting my favorite moments over the next few days. Kylo Ren can conquer the galaxy, but he has no interest in actually running it. This opens him up to all kinds of grifters and con men. Rey wants to be a hero, but she’s afraid of becoming a monster. Kylo wants her to be a monster with him, and he’ll make her kill people until he turns her. There’s your personal conflict. The big questions, denouement-wise, are A) Whether Kylo gets a redemption and B) Whether Rey has to kill him herself. Stay tuned. Finn started out fleeing the First Order, but now he’s a committed soldier. He’s the avatar for every faceless Alliance fighter who died so Luke could finally have a heart-to-heart with his dad. Poe is trying to be the leader Leia saw in him while retaining his dashing fighter pilot vibe. The Last Jedi was an awesome movie. Kylo wants Rey with him. It’s unhealthy but not necessarily sexual – he can’t articulate what he wants. His self-awareness is pretty limited. His strategy is to force her to kill a lot of people until she turns to the dark side. Both the Resistance and the First Order are battered. The Resistance is depleted and never had the industrial base the Alliance had. The First Order is overextended and it does not have the manpower to run its massive ships or control systems. The danger of Kylo isn’t that he’ll conquer the galaxy, but that he’ll burn it down. The galaxy is splitting from a peaceful order to a mess of competing systems. This is all background, though. The Republic funded the Resistance as a proxy militia, but never intended to fight the First Order directly. As the show begins, the Republic is still in chaos and trying to keep systems from seceding and going to war with each other. I’m basically punting on the ‘ships between Rey/Finn, Finn/Rose and Poe/*. Ashenden – leader of the Resistance Commandos. He is an aristocratic type, dashing and daring. In any other movie, he’d be the hero. Kear Alroy – a civilian leader for the First Order, a very effective administrator, but also corrupt and greedy. Picture an anti-Leia – she has Leia’s drive and sardonic wit, but none of her nobility. The Commodore – one of the highest-ranking officers left in the Republic. An old friend of Poe’s, but there’s not much he can do to help the Resistance. The pitch for this was pretty simple: Our Town, but on a space station, and with a murder. Where I come from isn’t exactly a small town, but it’s pretty close. As I picture a space station, I picture it being pretty much like that, but more so. No one’s moving in and no one’s taking off for the big city like I did. And murder always gives a story a good structure. The murder is the beginning, the end is the capture, and everything on the way is the middle. This is actually one of the first stories we did – The recording date was December 29, 2015. So yeah, this project was a long time in the works. Once again, we turn to Micah on this one as the unnamed Station Administrator. I think he’d actually be pretty good at that job. Alycia Yates joins us as Young Becky Clevenger, and that’s me (Tony Goins) making a cameo as the young murderer. This show puts me in mind of two other great shows that are under way right now. I’ve got them on my subscription list and I recommend them wholeheartedly. Our Fair City – Post-apocalyptic corporate satire. Uncanny County – Southern gothic horror with a southern-fried flair. Tony Goins: Like I said before, when we conceived of this series, we got a lot of submissions involving a child in peril … or a child as a cause of peril. This is my contribution to that genre. Our second child was born with a serious case of jaundice, culminating in an awful New Year’s in Columbus’ Children’s Hospital. Jaundice is pretty surreal: All the doctors thought he’d be fine, but there was a small chance he’d have permanent brain damage. Around the same time, I heard an old-time radio story (I can’t remember which one) about a fellow facing a family curse. The two ideas came together neatly. ” At night, she made little cries, and we’d pray for her to go to sleep. Then she’d be still, and we’d be sure she was dead.” – That’s real. Jenny Key is heart-wrenching as the scared mother Allison. I put the piece in her hands, and she carries it. But my single favorite moment is Aaron Sinclair’s breakdown. To really sell the horror, the character’s masculinity has to break. Aaron does not hesitate. Micah Jenkins continues to steal shows as Jerry, the kindly old Wiccan bookstore owner, and what else can I say about Alycia Yates? She has handled everything I’ve thrown at her. I love to *hear* her take something offbeat and knock it out of the park. Jerod Brennen does some behind-the-scenes work directing, and elevates the whole thing. He did a couple of impromptu discussion sessions between takes, working with the actors to find their characters. That’s a weak suit of mine, and very illuminating to watch. This piece has a clear antecedent in a 1930s series called “The Witch’s Tale,” a series of nasty tales narrated by “Old Nancy, the Witch of Salem, and her wise old black cat, Satan.” She’s like the Old Witch from the EC Comics, but right in your ear-hole. My usual source is Relic Radio, available wherever fine podcasts are sold. The following sounds are from Freesound.Org, and are acknowledged here with my deep gratitude. Our first little tale is entitled Dinner Party, and it’s about a couple of thieves … no, that’s not right. You know that couple that seems really perfect – hmmm, that would give too much away. You ever wonder what your neighbors are really – nah. Y’know, kids, you may just need to experience this one for yourself. Like a shotgun blast from the past, like the deadly kiss of the spider queen, like alien cilia entwining the hairs on the back of your neck! 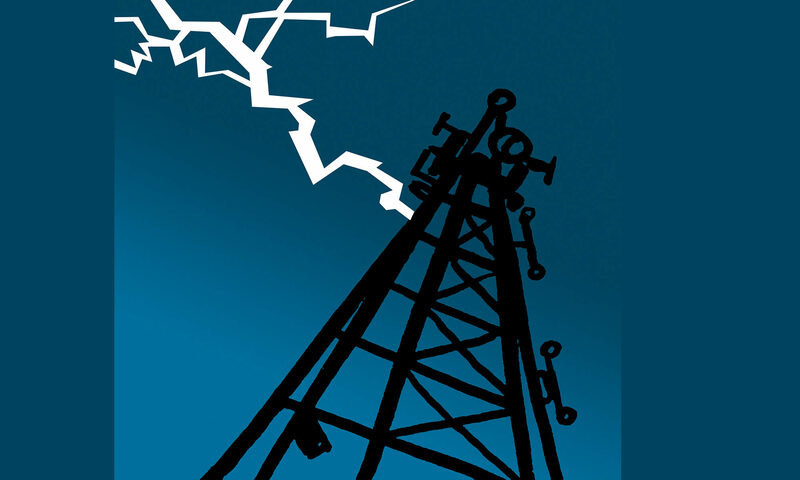 Distress Frequency: An original anthology of horror, sci-fi and adventure, bringing you the uncanny and the unreal! Where you never know if it’s the click of the guillotine — or the click of the airlock! … and wherever fine podcasts are sold.